This post is written by Tyler Short of Sustainable Agriculture of Louisville, and is the second in a three part series. You can view part one here. 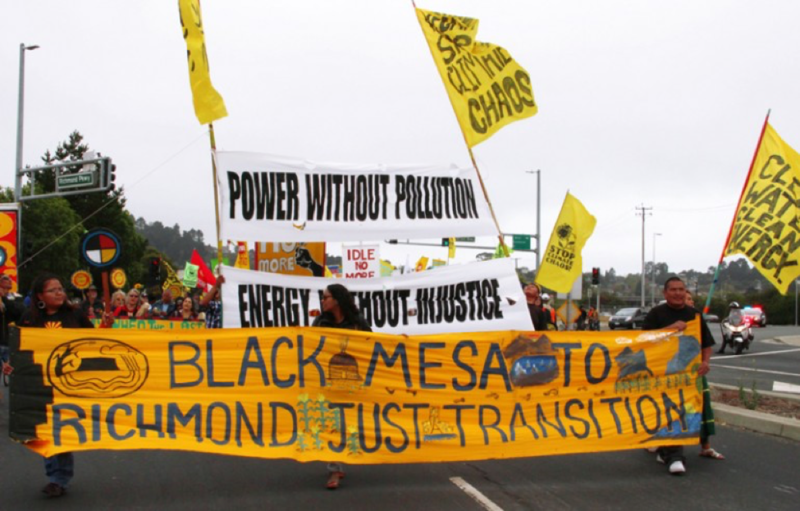 At the USFSA’s IV National Membership Assembly in Bellingham, WA (October 12–15), the Alliance will award the 2018 Food Sovereignty Prize to Black Mesa Water Coalition and Organización Boricuá de Agricultura Ecológica de Puerto Rico. The ceremony will occur on Sunday, October 14 (5:30–7:30 PM Pacific). Please follow the USFSA’s Facebook page to view a livestream of the event. This is the second post in a three-part series. Below, I spotlight Black Mesa Water Coalition (BMWC) and outline the Just Transition framework that underlies their restorative models of political economy. Part One of this blog series offered a background to Just Transition and Climate Justice Alliance. 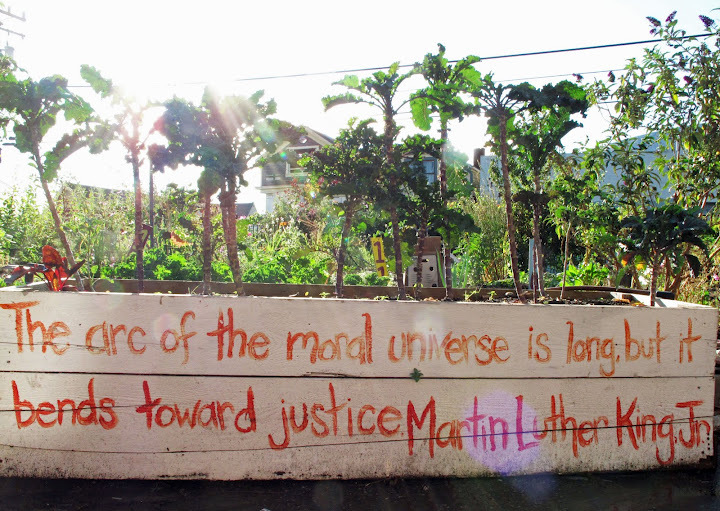 Part Three will analyze the notion of Just Recovery, specifically in terms of the Food Sovereignty Brigades mobilized by Organización Boricuá de Agricultura Ecológica de Puerto Rico in the aftermath of Hurricane Maria last year. How has BMWC applied a Just Transition framework to their environmental justice program among Diné (Navajo) and Hopi communities in northern Arizona? The Coalition underscores that energy must be owned and controlled by communities, not large corporations. Since its formation almost twenty years ago, the organization has fought to stop the dig-burn-dump process of polluting industries that extract water, coal, oil, natural gas, and uranium from the region. In 2005 BMWC and their partners succeeded in shutting down the Mohave Generating Station, forcing the Black Mesa Mine and 273-mile slurry pipeline to close. With solidarity from Our Power Communities organized through Climate Justice Alliance (there are currently seven total, including Black Mesa), BMWC has targeted the coal-powered Navajo Generating Station, which exploits water from the Navajo Aquifer and supplies energy to the 300-mile canal known as the Central AZ Project (CAP). The Coalition argues that renewable sources can power CAP and provide energy for the estimated 18,000 Navajo and Hopi homes lacking electricity. In addition to calling for the Navajo Generating Station to shift entirely to solar energy, BMWC has pushed to reclaim former mine sites, install solar panels, and connect the new infrastructure to existing transmission lines. Jihan Gearon, the Executive Director of BMWC, commented on the topic of funding for Just Transition projects during a panel discussion at the 2018 Protecting Mother Earth Conference in Nisqually, WA (June 28–July 1, 2018), “Money helps but can cause problems if you’re always chasing it.” The Coalition cites the Navajo Green Economy Fund as a major achievement, although it has lacked proper support from the tribal government since the legislation passed in 2009. Legal interventions have proven successful as well; for example, the CA Public Utilities Commission’s 2013 decision to use revenues from the sale of sulfur dioxide allowances to create a revolving fund in support of renewable energy development. Local employment remains a crucial problem for BMWC to address as they organize for visionary economic alternatives away from the extractive economy. The Coalition understands that workers need access to income-generating activities as part of the fair shift towards a green economy. BMWC advocates for a holistic approach that would create meaningful employment in renewable energy production and also revitalize traditional food and fiber production lifestyles. BMWC directs a Restorative Economy Program that emphasizes resistance to extractive production, simultaneously enabling locally-driven models that meet human needs and revive ancestral values rooted in ecologically-sound, culturally-appropriate practices. The Navajo Wool Market Improvement Project directed by BMWC includes weaving workshops, trainings on increasing a herd, and demonstrations that involve shearing, sorting, and grading wool. By hosting an annual Wool Buy since 2012, the Coalition has contributed significantly to raising the incomes of traditional wool producers and processors, while strengthening intergenerational relationships for young practitioners to learn from elders and reproduce customs foundational to their place-based identities. BMWC’s objective to enhance the viability of small-scale wool production overlaps with the core purposes of their Food Sovereignty Project to ensure community wellbeing, reverse cultural erosion, and realize self-determination as indigenous peoples. BMWC embraces food sovereignty as a platform for fighting to protect humans and other-than-human life from direct threats imposed by the structural forces of settler colonialism and capitalism. Based on a 2014 report, an alarming amount of Navajo Nation residents must drive hours to border-town stores off the reservation to access healthy and affordable food, which negatively affects reservation markets and undermines smallholder production for local consumption. BMWC promotes indigenous food sovereignty as a set of grassroots solutions to decommodify food and land, ending their use as weapons, while also creating a collective capacity to survive and enjoy the abundance of gifts from Mother Earth. Leaders of the Coalition call for policies that would propagate and protect local food systems, mainly by redistributing land, removing barriers to obtain grazing permits, providing farmers’ access to credit, ending subsidies to agribusiness, and halting the biopiracy and contamination of native seeds. 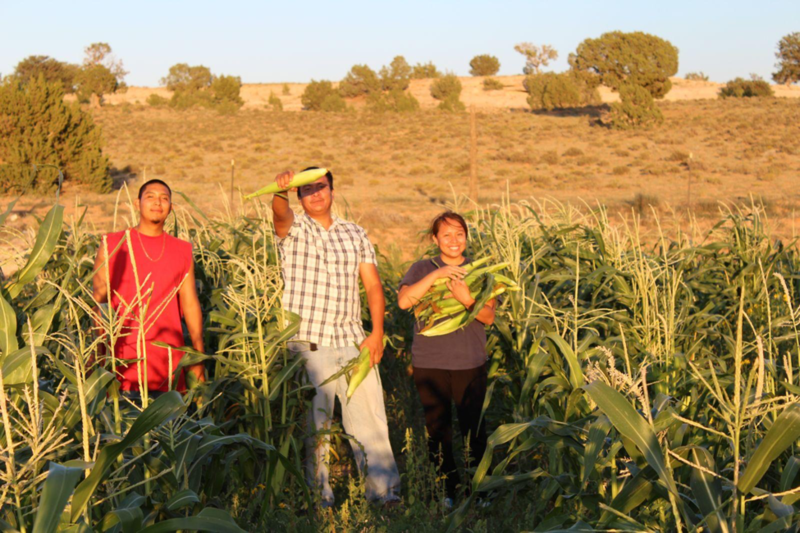 Roberto Nutlouis – the Restorative Economy Program Coordinator – facilitates popular education at a thirteen-acre community farm in Piñon, AZ, where BMWC affiliates learn about native plants, traditional cultivation techniques, watershed management, and cooking. The Coalition recently hosted its first annual Harvesting Our Kinship Festival (October 4–5, 2018), an educational celebration for honoring past struggles and inspiring young people to become agents of social change. This entry was posted in Defense of Mother Earth, Food Sovereignty, Indigenous Sovereignty and tagged Food Sovereignty Prize, Indigenous Environmental Network, Just Transition, Tyler Short. Bookmark the permalink.